We have a quality selection of lighting equipment available at SGS Engineering, including halogen lamps, LED site lights, portable work lights, and LED lights for construction. We stock a range of Defender lights, such as hanging light chains and floor lights. This means that if you’re looking for a halogen or LED work light for a workshop or construction site, then we have an option for you. At SGS Engineering we have a variety of lighting equipment from trusted brand; Defender that are ideal for workshops, job sites, construction sites and small areas. The lights are floor lights with a strong and sturdy metal floor stand, magnetic feet and rubber grip handle. Also available are the festoon hanging light chains in BC fittings and ES fittings. The festoon hanging lights are to use to illuminate areas for job sites, walkways. work areas and they can be used for decoration for events. The lights can be used either indoor or outdoors due to the integrated mesh guards that protect the lamps. The defender uplight can also be purchased online which is ideal for plastering and general decorating jobs, construction sites and event lighting with its broad, near shadow free illumination. The light is protected by a impact resistant polycarbonate lens and has a shatterproof tube. Whether you’re searching for work lights for indoor or outdoor use, we have many models available from Defender, an industry leading, trusted brand. Our Defender site lights come in a variety of voltages and fittings, and all are guaranteed by a free warranty. For lighting chains, we have the Defender Festoon Hanging Light Chain, which is available with ES or BC fittings. Ideal for walkways, these 110V site lights are insulated for outdoor and indoor use, and can extend up to 22 metres. Also available are a large range of floor lamps. Choose between LED floor lights, halogen floor lamps, and rechargeable LED work lights, in 110V or 240V. With toughened glass and shatterproof lenses, shock absorbing aluminium, polycarbonate casing, and sturdy metal supporting frames, our range of portable LED work lights and halogen work lights can be tilted, making them perfect for smaller jobs. Alternatively, purchase the Defender Uplight, a low energy, super bright work light that is ideal for plastering and decorating. 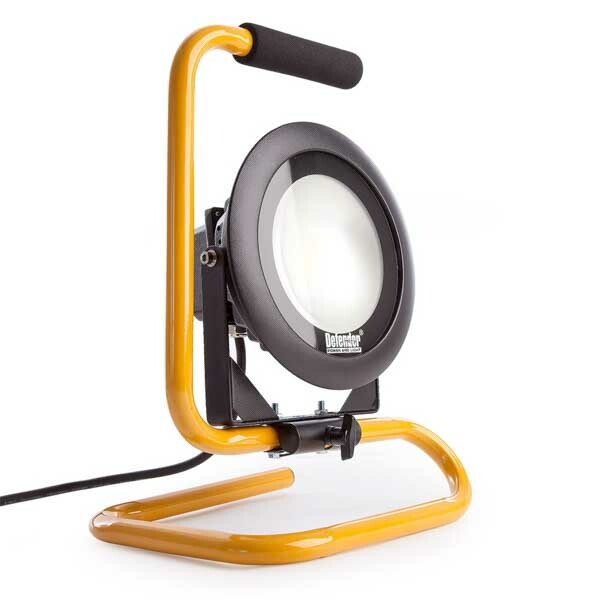 Shatterproof and sand filled, this floor standing LED light is built for use on tough construction sites. Order your lighting from SGS Engineering and whether it’s an LED work light or halogen lamp, you can enjoy free next day delivery - check terms and conditions here. Additional delivery options are available and you can get in touch with our team if you have any queries.